As President Trump prepares to embark on a five country journey to Asia, including stops in Japan, Korea, China, Vietnam, and the Philippines, his team has been working in overdrive to ensure that the visit is a success. Although domestic politics now threaten to distract, the trip is about the United States and its role in the region, not about the president, his advisors, and their political machinations. The president needs to keep his focus looking east and not in the West Wing. Here are a few thoughts about what could and should happen on the trip. A one-sided love affair—finally reciprocated? Since coming into office, President Trump has let loose a stream of tweets and other commentary proclaiming his admiration—even affection for Xi Jinping. “We’ve gotten to know each other very well. A great leader. He’s a very talented man. 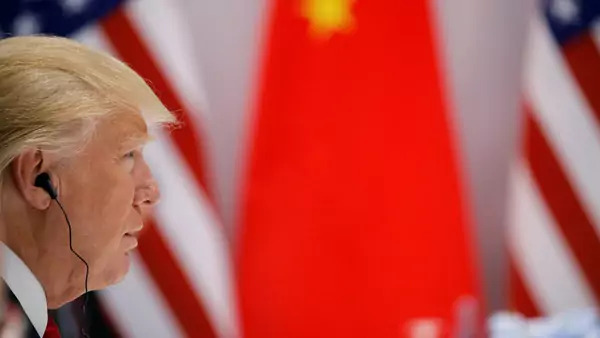 I think he’s a very good man.” At times, it appears as though he has a high school crush on the generally impassive Chinese president: “We had a great chemistry, I think. I mean at least I had a great chemistry — maybe he didn’t like me, but I think he liked me.” Most recently he congratulated the Chinese president for his “extraordinary elevation,” and likened Xi to a king. It could be part of a larger strategy to lull the Chinese president into a false sense of complacency, but it is unusual for a democratically-elected president of the United States to pay tribute to a politically repressive authoritarian leader who seeks to have China displace the United States as the regional hegemon. Moreover, President Xi has not given any sign of reciprocating the U.S. president’s affections. Maybe President Xi is waiting for a more private moment, for example, when the two tour the Forbidden City with their wives, but if President Trump doesn’t feel the love soon, he should look elsewhere for a new object of his affection. Many U.S. allies would welcome the type of positive reinforcement the president has lavished on Xi Jinping. The chatter around a grand bargain with China has dimmed as President Trump’s trip to China nears. It is easy to see why a grand bargain might appeal to the Trump administration: First, it has the word “grand.” Like the set of Trump towers in Florida, the Trump Grande. It is also a form of a deal—something with which the president has a lot of experience. And, if sufficiently noteworthy, a grand bargain would immediately vault President Trump into the history books alongside his erstwhile China whisperer Henry Kissinger. The hope for many Asia watchers was a grand bargain around the denuclearization of North Korea. Yet it now appears there will be no grand bargain—not on North Korea, not on trade, and not on the South China Sea. That is ok. A grand bargain should take time and thought, and the administration has not had much of either over the past ten months. This trip should focus on figuring out next steps in addressing the DRPK crisis. Beyond pushing China to implement the sanctions already in place and perhaps getting them to introduce a few more, one option would be to bring Korea, Japan, and Russia back into the conversation. In this case, five heads may well be better than two. In their first meeting at Mar-a-Lago last April, Presidents Trump and Xi rebranded and reorganized the bilateral discussions between the United States and China into the United States-China Comprehensive Dialogue with four tracks: the Diplomatic and Security Dialogue, the Comprehensive Economic Dialogue, the Law Enforcement and Cybersecurity Dialogue, and the Social and Cultural Issues Dialogue. Unfortunately, the new name and format did not bring any new meaningful results. While President Trump will likely walk away with a few business deals from his time in Beijing, there is almost certainly not to be any major new offer of market access or significant structural reform on the Chinese side—which is really what is needed to level the playing field, as the White House has called for. If the United States wants to force change, it will have to play hardball. Since taking power, Xi has only enhanced China’s mercantilist tendencies and believes they will win the day. Selective U.S. tariffs on Chinese goods such as aluminum foil can signal unhappiness, but they do not form the basis of a strategy. Instead, the United States needs to reinforce its bilateral moves by coordinating with its allies, such as Japan, Germany, the U.K., South Korea, and Australia among others. This will mean being prepared to develop a comprehensive, multilateral trade and investment strategy to address the uneven playing field. Everyone is tired of China playing with under-inflated footballs. China is but one stop on the President Trump’s Asian adventure, but the president’s overwhelming focus on Xi and China make that difficult to remember. The region is full of U.S. allies and partners, all of whom are awaiting a signal from the president, demonstrating that they matter—or at least that he remembers their names. Although the vice president, defense secretary, and secretary of state have all made forays to the region trying to underscore a continued U.S. commitment, the president’s words will carry special weight. The president can allay regional fears that the United States is commitment-phobic, by reinforcing at each stop that Washington’s allies and partners are the cornerstone of U.S. engagement in the region. Reiterating the U.S. commitment to freedom of navigation, free trade, and political freedoms will also reassure regional actors that it still makes sense to buy into a regional order underpinned by a U.S. alliance system. Of course, this trip is only a first step in putting the United States on firmer ground in Asia, after many months of confusing signaling and disruptive initiatives. The next step should be creating a strategy for dealing with Chinese maritime assertiveness, the regional rollback of democracy, and the advancement of free trade (since the United States pulled out from the Trans-Pacific Partnership). But first things first—let’s just hope the president and the rest of the world can enjoy a tweet-free, drama-free ten days.